Photograph of Gunner Arthur Gale published to accompany the obituary in the Grantham Journal in November 1917. Gunner Arthur Gale's obituary published by the Grantham Journal in November 1917. Arthur Gale was born on the 26th September ,1895, and baptised on the 27th October, 1895, at Long Clawson. He was the third child of Goodsir Gale and Rebecca Gale nee Flowers. His father was born in 1865 at Muston, his mother in 1892 at Marston, Lincs. In the 1901 census he was with his parents at Ab Kettleby, together with his siblings George Henry (b.1893), Wlliam Frederick (b.1894) and Hilda Jane (b.1888). However, in the 1911 census, he was recorded at work, aged 15, as a yard boy at the farm of George William Musson at Wartnaby. Arthur Gale served as 149223 Gunner, “A” Battery, 174th Brigade Royal Field Artillery. 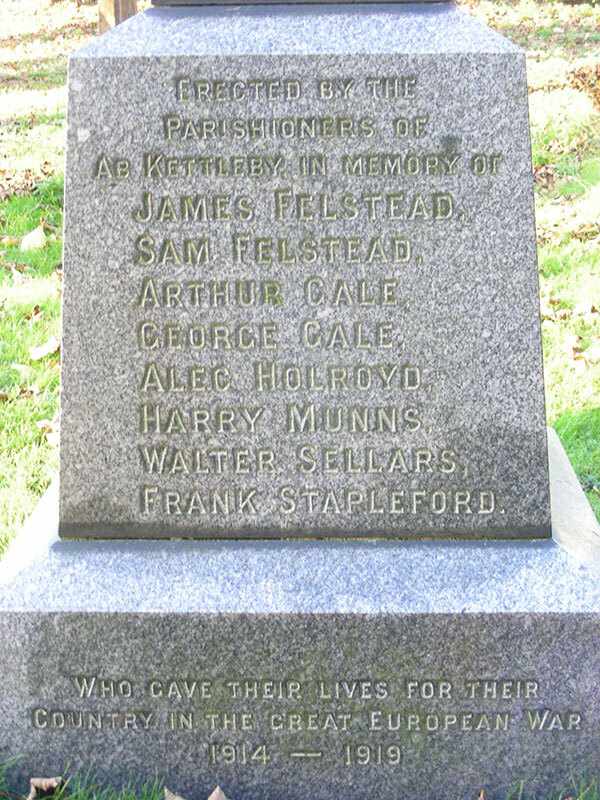 He was Killed In Action on the 30th September, 1917, and was buried at La Clyte Military Cemetery, West-Vlanderen, Belgium, with the inscription “son of George and the late Rebecca Gale”. He was just 22 years old. Arthur Gale’s obituary was published in the Grantham Journal on the 3rd November 1917, and the Gale family inserted ‘In Memoriam’ notices on the 28th September, 1918, and 27th September, 1919. The obituary reported that he and two of his comrades were killed by a shell which fell right into the gun-pit. Arthur Gale is remembered on the War Memorial at Ab Kettleby, detail of which is provided by the Leicestershire War Memorials project, where provides an excellent summary prepared by Mr Michael Doyle, curator of ‘Their Name Liveth For Evermore: The Great War Roll of Honour for Leicestershire and Rutland’. The 174th Brigade (the CLXXIV Brigade), part of the 39th Division (New Armies) from 1915 to 1918, had originally been raised at the Thames Ironworks. During 1917, the 39th was part of the 3rd Battle of Ypres (Long Long Trail website). Killed in Action, September 30th, 1917, and buried at La Clyte Military Cemetery, West-Vlanderen, Belgium. He is remembered on the War Memorial at Ab Kettleby.